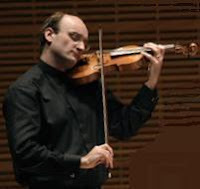 Andrew Manze is an English baroque violinist and conductor born on January 14, 1965 (Perlman was 19 years old.) He studied with Simon Standage, one of the founding members of the English Concert, at the Royal Academy (London), as well as with Lucy van Dael and Marie Leonhardt. In 1988, (at age 23) he became concertmaster of the Amsterdam Baroque Orchestra. He was also a member of the ensemble Romanesca with John Toll (harpsichord) and Nigel North (lute.) From 2003, he was director of the English Concert, after harpsichordist Trevor Pinnock retired but gave the position up in September, 2007 (to organist Harry Bicket.) In 2006, Manze became chief conductor of the Helsingford Symphony Orchestra (Sweden.) He has made several recordings for Harmonia Mundi records but you can also catch him on YouTube.